Who doesn't have a Mr. Potato Head (or several) in their toy chest? This toy has been a classic for so many years...Of course, it has evolved. We can now purchase an entire Potato Head family. Although it seems like a very basic toy, Mr. 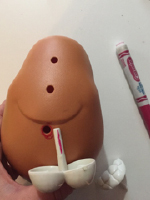 Potato Head can provide children with the opportunity to develop a wide range of aspects including hand-eye coordination, fine motor skills, body part recognition, and body map awareness. The advantages associated with the exploration of this toy make it very interesting in a daycare setting. Read on to discover different ways to play with this popular character as well as new ideas that require simple material you most likely already have on hand. To begin, here is an idea to get children moving. You can therefore add the development of gross motor skills to the list of benefits associated with your Mr. Potato Head figurines. Create a simple obstacle course and set a box containing your Mr. Potato Head parts and accessories at the start line. Children stand in line at the start of the obstacle course and take turns picking a part or accessory, completing the obstacle course, and adding the part or accessory to the Mr. Potato Head body. To increase the level of competition somewhat, divide your group into two teams and set a Mr. Potato Head body at the finish line for each team. The first team that completes their Mr. Potato Head wins (determine the necessary parts before starting the relay race). You can also use your Mr. Potato Head as a positive reinforcement system. Target a specific challenge with your group. Every time children succeed, give them one Mr. Potato Head part or accessory. Once all the parts and/or accessories have been inserted in the Mr. Potato Head body, children can enjoy a privilege or receive a special treat. This game is perfect for very young children. Use a different marker to color the plastic pin behind each Mr. Potato Head part or accessory. Identify the hole each pin must be inserted in on the Mr. Potato Head body using the corresponding colors. Children take turns picking a part or accessory, naming the color, and identifying the color on the Mr. Potato Head body. If you wish, you could also create silly characters by randomly coloring the holes on your Mr. Potato Head body. Have fun admiring the silly result once all the parts and accessories have been added. Draw several different Mr. Potato Head characters on white pieces of paper. Laminate the models and add them to your Mr. Potato Head bin. Each character must require different parts and accessories. The characters can be "normal" or silly. Children observe the model of their choice and replicate it by adding the corresponding parts and accessories to the Mr. Potato Head body. Use your Mr. Potato Head parts and accessories for a tracing activity. Encourage children to trace the contour of the pieces on paper to create unique "portraits". I have often used my Mr. Potato Head to encourage children to pick cards/illustrations for language stimulation activities. Simply arrange the cards in a pile. Have children take turns picking a card, encouraging them to name the illustrated item. Once they have succeeded, invite them to add a part or accessory to your Mr. Potato Head. Once the character is complete, start over again. You may also name the items if children are very young. Simply hearing the words will be beneficial for them. Older children need to work on their ability to follow a sequence of actions to complete a task. Illustrate different parts and accessories that are to be added to your Mr. Potato Head body. Number them and arrange the illustrations in order. Encourage children to observe the order and complete the character, adding the parts and accessories per the predetermined order. Use a die. Stick a picture of a body part on each side of the die. Give each child a Mr. Potato Head body. Have them take turns rolling the die and inserting the body part shown on the die in their figurine. If a child rolls a body part he has already added to his Mr. Potato Head body, he must skip his turn. The first child who completes his Mr. Potato Head wins.